Hope To See You Tonight!! 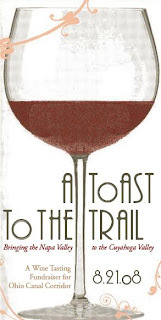 Tonight’s the night for the wine tasting fundraiser for the Ohio Canal Corridor called “A TOAST TO THE TRAIL”. You’re guaranteed a good time. I’ll be there, actually, I’m not the sell. Q104’s Rebecca Wilde emcee the brand new event to support the OCC. The event goes from 6:00 PM – 9:00 PM at The Atrium at Blue Point. 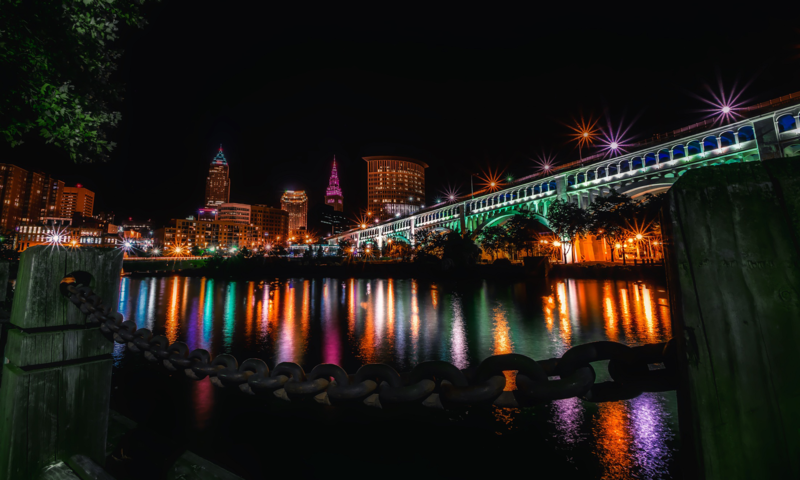 It is located at 700 West St. Clair Ave. in Cleveland’s Historic Warehouse District. The price per person is $75.00. You can get tickets at the door tonight. The price is well worth it! There is also a painting by a local artist that will be auctioned off. A new bike, all sorts of wine and the list goes on and on. Back to you Bob! If you live downtown, you’ll benefit from the work the OCC is doing. Read more about the Towpath Trail. Hope to see you there tonight! After being on a day schedule for more than a week, it’s time to switch the body back to vampire mode. You’ll spot me out and about today in my bat form. I am probably the only person who’s happy that it’s a cloudy day. I need to make myself sleep today throughout the day to start the process. Of course, my place has two walls that are windows from floor to ceiling. No one warned me when I moved in that I would be working overnights. Summer is rough because the sunlight pours in the windows. Almost every room I have has a large window. There are three places in my place where you won’t find windows, two bathrooms and a closet. My bathrooms have cold granite tiles floors, my closet is oddly shaped, believe me and there’s no way I’m curling up in there. 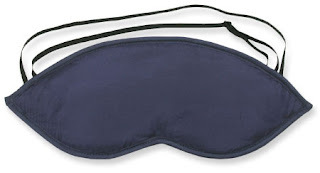 I’m going to take some advice and buy a sleeping mask. Of course, I feel like I’m giving up some of masculinity in buying it. They need to block out the light. Keep me from seeing sun. When I see light, my body starts the process (think shuttle countdown) of waking me up. I want to make sure I sleep better this time on the overnights. If you check out some of the masks through the hyperlink, you’ll see they’re expensive. If I’m going for a mask, I want it to be comfortable. Well, wish me luck getting sleep. This week isn’t going to be that bad because I have to work two more days. I’m off Friday which reminds me to remind you about the “Toast To The Trail” again Thursday night at the Atrium at Blue Point. Make sure you check out the Ohio Canal Corridor’s website for more details. Please buy a ticket and support this great cause! Things are really coming together for the upcoming fundraiser for the Ohio Canal Corridor. The site is ready. The wineries have signed on. The raffles and auction packages are coming together. One quick sneak peek is Continental’s gift of two tickets to anywhere in the United States. Thanks, Continental! I have some invitations that you should expect to be getting from me. It should be a very fun night. I do want to mention another item that could be yours on Thursday, August 21st. Artist Ingrid Hoegner is graciously donating one of her works. It is a 14″ x 30″ gallery wrapped canvas of “Row Of Bottles”. If the painting looks somewhat familiar, it’s because you’ve probably seen her work hanging up at D’Vine restaurant. I’ve always been a big fan of her paintings. I’m probably going to end up buying one for my place. It could use some great artwork and from a Cleveland artist to boot. Support the local arts! Okay stalkers out there, here’s the rundown for what’s going to be a looong 4-days! After I leave work tomorrow, I’m off until Monday. God, thank you for some vacation time. Will I rest? No! Of course, I’m packed to the gills with plans. I have a planning committee meeting with the Ohio Canal Corridor about the upcoming “Toast To The Trail.” If you don’t know about it, make sure you save the date. It’s going to be a lot of fun. The night should be a lot of fun. The Indians take on the Tigers for a businessman’s special. First pitch is 1:05pm. They are my two favorite teams and I get to see them at Jacobs (ahem, Progressive) Field. I get to hang out with one of my best friends, Rebecca, at “Twilight At The Zoo”. Oh, the humanity! Add Disco Inferno into the mix and there will probably be some debauchery involved. Get up early and be down in Wayne County, we’re talkin’ Sterling people for the Schorle Family Reunion. I’ll eat, shake some hands, get a couple of inappropriate hugs by a couple of relatives. Don’t worry, I’ve been through the situation with my therapist. I joke. I can’t stay that long because it’s Camp Krusty’s on Whiskey Island. I’ll spend the day with R+R, Patrick & Lisa and whomever else will be on the island for the big fundraiser for the Malachi House. Gotta support the neighborhood non-profits! REST — Did I just fill up all of the days off? Relaxation, who needs it?